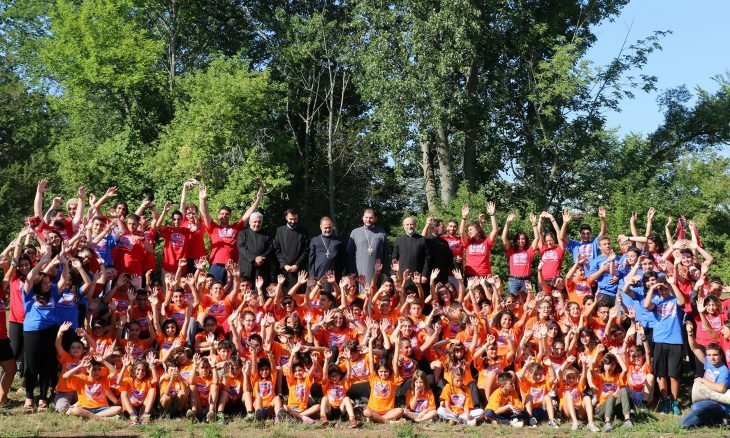 On August 17-19, 2016, His Grace Bishop Abgar Hovakimian, Primate, accompanied by the Diocesan clergymen, visited the Diocesan Annual Camp Ararat at Ameliasburg, Ontario. 126 campers and mentors from all over Canada are spending an unforgettable week of religious education, the Armenian national traditions, history, songs, dance, games, and beyond, under the leadership of Rev. Fr. Myron Sarkissian, Camp Clergy, Mrs. Ani Altounian, Executive Director of the Camp Ararat, Mrs. Arpi Kurkjian, Camp Director, and a devoted team of volunteers. This year, the number of campers from newly-arrived Syrian Armenian refugee families was increased thanks to the contribution of the Diocese. On August 19, the campers had an opportunity to meet the clergymen and members of the Diocesan Council, who had come to the camp to participate in the Clergy and Diocesan Council meetings.